Your business needs quality content to drive more visitors, attract new customers, generate new leads and subscribers, and remain competitive online. 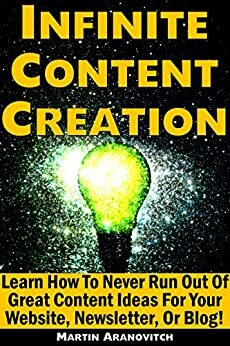 "Infinite Content Creation" is a practical step-by-step course that shows you how to keep coming up with endless new content ideas for your website, newsletter, or blog. - How to design an effective content marketing strategy and content plan. - How to develop the habit of publishing content regularly using a simple content creation system. - How to generate endless new content ideas for website, newsletter, and blog articles, product descriptions, post headlines, sales copy, social media, promotional pieces, news releases, training clients, FAQs and more. - How to turn your website into an automated web traffic machine. You will also learn how to unlock your infinite content creation potential and channel your ideas into published content that will keep your visitors, readers, and prospects, and subscribers interested and engaged. "Infinite Content Creation" is a course of action and results. The author has spent years creating web articles, blog posts, newsletters, tutorials, guides, reports, e-books, courses, videos, and more, and understands the challenges and difficulties of generating new ideas on a regular basis and turning these into published content. In addition to practical methods for generating new content ideas, this course will show you how to get great results online whether you choose to write content yourself or outsource your content creation. - Outsourcing Your Content Writing ... The Right Way! Download "Infinite Content Creation" today and learn how to keep coming up with quality content ideas to drive more visitors and prospects to your site, generate new leads and newsletter subscribers, and grow your business faster.